Vídeo promocional de Granada. Recorrido aéreo por el Barrio del Albaicín y La Alhambra. At the foot of the Sierra Nevada mountains, between the rivers Darro and Genil, lies one of the most interesting cities in Eastern Andalusia. As well as its impressive Al-Andalus heritage, there are Renaissance architectural gems and the most modern facilities, fit for the 21st century. Granada has an unmistakable Moorish essence, due to the fact that it was the last city to be reconquered by the Catholic Monarchs in 1492. The gastronomy, craftwork and urban planning are influenced by its glorious past. Fountains, viewpoints and "Cármenes", houses surrounded by typical gardens of this city, create unforgettable corners in the city. It is no surprise that one of its old neighbourhoods, the Albaicín, has been awarded the World Heritage designation, together with the Alhambra and Generalife. It was an important cultural centre for many centuries, under the Moors and the Christians too, and nowadays it boasts a broad cultural and leisure programme. Film, music or theatre festivals are complemented with permanent or travelling exhibitions on all fields of knowledge. Old Renaissance palaces hold seminars, conferences and discussions, while the most innovative infrastructures are prepared for great events. Granada has a vast network of accommodation, including historic buildings, such as the old convent of Santa Paula (AC Hotel) and the convent of San Francisco (Parador de Turismo located inside the Alhambra), "cármenes" (traditional villas with gardens) in the Albaicín, and cave houses in Sacromonte.Because of its great communications, its marvellous climate, its beaches, and its snowy mountains, Granada is a unique destination for cultural, adventure and business travel. 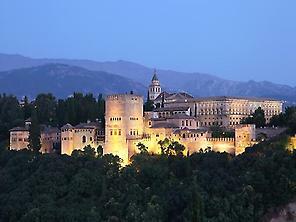 The reddish hill on which the Alhambra is built holds the Alcazaba and the Nasrid Royal Palaces. This beautiful monument with art by the Moors and from Granada, built between the 13th and 15th century, has many rooms connected with courtyards, gardens and fountains. Its intricate architectural details can be seen in places such as Patio de los Arrayanes and de los Leones courtyards, in the Hall of the Ambassadors or in the Dos Hermanas Room. On this hill you can also find the Generalife Gardens, the summer residence of the Nasrid monarchs, and the Palace of Carlos V. The latter is a Renaissance construction which holds the Fine Arts Museum and the Alhambra Museum. The first has an important collection of artists from the 16th century, including Alonso Cano and Machuca. The second is an excellent way of getting to know the Spanish-Moorish art of Granada. The Albaicín neighbourhood spreads out on another of the hills in the city. Steep and narrow streets lead to "cármenes" (houses with a garden), old mosques on which churches have been built (San Salvador, San Bartolomé or San José) and small squares such as San Nicolás and San Cristóbal. These two squares have beautiful views of the Alhambra and the peaks of the Sierra Nevada mountains. 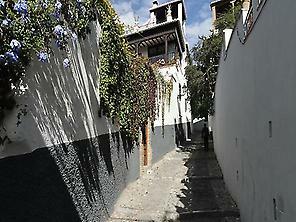 Between the walls, Elvira Gate and Carrera del Darro, the Albaicín neighbourhood hides many other treasures. The Arab baths (El Bañuelo), the Mudejar decoration of the Santa Isabel la Real Convent, the Renaissance floor plan of the Córdova palace and of the Santa Catalina de Siena Convent, or the impressive façade of the Real Chancellery are some of them. The highest part of the hill is taken up by the district of Sacromonte, which is the ideal place for seeing the cave-houses of Granada, the zambras (flamenco dancing) and the Chapel of Santo Sepulcro. The district known as Realejo is located between the steep streets and the flatter area. Its most interesting spots include the Carmen de los Mártires, the Campo del Príncipe, the Manuel de Falla House-Museum and the Casa de los Tiros. The noble houses and small palaces of the area contrast with the Muslim street layout. The best way to approach Christian Granada is to visit the Cathedral. Beforehand, you will pass by the Corral del Carbón, an old Arab corn exchange, which is the present site of the Andalusian Legacy Foundation, and the Plaza de Bib-rambla, famous for its flower market. Also of Arab origin are the Alcaicería (silk exchange), an ancient souk where nowadays you can buy regional crafts; and the Palacio de la Madraza, an excellent example of Muslim architecture. The Royal Chapel, where the Catholic Monarchs are buried, leads to Granada Cathedral. Although it originally had a Gothic layout, it was finished following the Renaissance style, according to the plans of Diego de Siloé, one of the most renowned artist of the times. 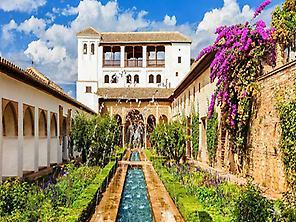 Granada's rich heritage continues in the exhibitions and collections of the most prestigious museums. Visitors should set aside time to admire the pieces in the archaeological museum. The Rodríguez Acosta Foundation, the Federico García Lorca Stately Home, and the José Guerrero Art Centre are some of the museums dedicated to local figures. However, the Science Park may be the attraction best suited to the tastes of people of all ages. It is an interactive museum with more than 200 exhibits about the biosphere, the senses, perception and inventions, as well as the planetarium. For convenience in visiting the main monuments, visitors can purchase the Bono Turístico (Tourist Pass). It is a multi-pass that includes a visit to the Alhambra, the Generalife, the Cathedral and the Royal Chapel, the Carthusian Monastery, the Monastery of San Jerónimo and the Science Park. With this pass, EU citizens will gain free access to the Archaeological Museum and the Fine Arts Museum, while others will gain a 25% discount from the admission price. It also includes 10 trips on the city's buses and microbuses. The privileged location of Granada, together with the mild climate, are the perfect conditions to practise many sports both on the field and in contact with nature. Without having to leave the city, the Municipal Sports Arena offers visitors its facilities for basketball, handball, table tennis, volleyball, 5-a-side football, martial arts… Another proof of Granada's interest in sports is the Long-Distance Grand Prix, which takes place in several parts of the province. On the outskirts of the city, in Las Gabias, golf lovers will be able to improve their par in the 18-hole course at the Granada Golf Club. In this town there is also a clay-pigeon shooting and Olympic shooting range, an exceptional place to practise your favourite sport whilst enjoying the splendid views of the Sierra Nevada mountains. This mountain range has the highest peaks in mainland Spain (Mulhacén - 3,482 m, and Veleta - 3,392 m), and a national park, which is also a Biosphere Reserve. It is covered in snow almost all year round, which causes a system of torrents, rivers and streams that irrigate mountains, ravines and valleys, and also creates many aquifers and springs. The variety of mid- and high-mountain ecosystems guarantees a rich environment in this unique location. These protected spaces have Visitor Centres, Information Points and Nature Workshops where visitors will be informed of the resources and routes available. The mountains are also the perfect setting for snow sports - at the Sierra Nevada ski resort. More than 100 kilometres of pistes and a wide offer of leisure activities including indoor swimming pools and ice rinks are all available in the mountains. Many companies propose adventure sports (quad, cycle tourism, horse riding routes…) or aerial sports (microlighting and paragliding), in the Sierra Nevada National Park and in the Sierra de Huétor Nature Reserve. To discover the aquatic environment, northern Granada offers a visit to the Cueva del Agua, while, to the south of the province, the immense, beautiful beaches of the Costa Tropical unfold. Water sports can be practised all year round, thanks to the area's microclimate. The towns of Almuñécar, Salobreña and Motril are places where visitors can enjoy both the beaches and lovely historic quarters, well worth visiting. Because the city is near the Sierra Nevada ski resort and the Costa del Sol, where tropical fruit is grown, the traditional cuisine of Granada has an exotic touch, with deep Moorish roots. Fish from the sea, country dishes from the Alpujarra and the delicious produce from the vegetable gardens in that area make up a mysterious and pleasant cuisine. Granada is famous for its large amount of bars, taverns, cellars, restaurants and tea shops, where you can taste typical products and practise the popular tradition of "going out for tapas". It involves going from one bar to another and enjoying small and varied portions of typical dishes which are often free with your drink, normally local wine or a caña (a small glass of beer). Tipping is not obligatory, although it is common practice. There are established routes and perfect places to practise this gastronomic tradition: Navas and Sarabia streets near the Town Hall, the Albaicín neighbourhood, around the bullring or in Plaza Bib-rambla. Other suggestions: - High quality restaurants in the area around the cathedral, like in the Plaza del Campillo. Some of the most typical dishes are beans and ham, migas (fried breadcrumbs with meat and peppers), gazpacho, Sacromonte-style omelette or products such as Trevelez ham, asparagus or tropical fruit. - Sweets made in monasteries: in convents such as San Antón, Zafra, Las Tomasas and La Encarnación you will be able to purchase products made by the cloistered nuns. The most famous are glorias and tocinillos. Granada has an important university and many students live in the city - thanks to this there are many leisure activities for young people. The programme at cinemas, theatres, auditoriums and exhibition halls is completed with many festivals that are celebrated in the city. The International Music and Dance Festival fills the most beautiful corners of the city with classical music, flamenco, ballet and dance. Prestigious artists perform in the Patio de los Arrayanes courtyard, the Palace of Carlos V and the Generalife Gardens, amongst other historical buildings, and concert halls. Jazz lovers will be able to go to the International Jazz Festival, which fills the Isabel la Católica and Alhambra theatres with beautiful chords, while the so-called "Trasnoches" take place in live music clubs. Another festival is the International Young Film Makers' Festival, which shows short films by young directors. There are also Flamenco Festivals, the International Puppet Theatre Festival or the International Magic Festival. We can't forget the International Theatre Festival, which brings the best current performances, or the International Tango Festival. Granada organises many other festivals that fill the streets with life and cultural activities. A good chance to enjoy the festive atmosphere is Easter week, which has been designated of National Tourist Interest. The Conquest of Granada Festival or the Crosses Festival, when the houses and courtyards are adorned with flowers, are also worth seeing, as well as the Corpus Christi Fair (with important bullfights) or the festival of the Virgen de las Angustias. These days there are open-air celebrations and a broad programme of activities. But you don't have to wait until then to enjoy leisure in Granada. Any time is a good time to practise one of the most deeply-rooted traditions in the city: going out for tapas. Although this tradition is present in many other Spanish cities - when they serve a small portion of regional food with your drink - in Granada it is considered to be an art. 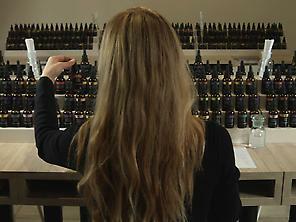 Moorish aromas pervade these tasting sessions, as well as many restaurants and tea shops. On warm nights in Granada you can have a drink at a terrace in one of the squares, go for tapas in bars (young people usually go to the Pedro Antonio de Alarcón area; and to the centre, in streets near Plaza Nueva or the cathedral). Cocktail bars and discos with different music styles, to dance until dawn, can be found on Calle Elvira and the surrounding area, on the Gran Vía, Paseo de los Tristes, Plaza Nueva, and next to the bullring. Sports lovers will be able to practise all kinds of sports at the Municipal Sports Arena, or go to Sierra Nevada Mountains to practise snow sports and hiking. The Costa Tropical, with vast sandy beaches, is an exceptional spot to practise water sports. But if you don't fancy leaving the city, you can relax in the Arab baths, which are part of the thermal water tradition in Granada. Young people travelling with the ISIC international youth card, and with the student card, will enjoy discounts in many museums and exhibitions. They will also get a reduced price on city bus tickets. As well as many activities on the beaches on the Costa Tropical, Sierra Nevada National Park (next to the Padrollano ski resort), and the Sierra de Huétor Nature Park, children will also enjoy their visit to Granada. The cultural programme in Granada caters for children and has proposals for all the family. They will have great fun at the Science Park Museum. This interactive museum offers more than 200 experiences relating to the biosphere, perception, inventions and scientific discoveries. One of the rooms has been designed specially for children from 3 to 7 years old, where they will be able to play and explore at their leisure. The planetarium, which is part of the museum's facilities, offers a programme for children which teaches them about astronomy with stories and pictures. The José Guerrero Art Museum also organises tailored guided tours so children can learn about contemporary plastic arts. International festivals such as the Magic, Puppets, and Theatre with Objects festivals are for children and adults alike. Stages and performances appear all over the city. The "Huerto Alegre" Educational Innovation Centre proposes ecological itineraries so children can get to know about the environment in Granada. Even the Manuel de Falla Auditorium has educational and family concerts aimed at music lovers with less experience. During Christmas, Juveándalus (Children's and Youth Fair) is a great opportunity to enjoy all the stalls and stages that are installed. With the Children's Tourist Pass (always linked to an adult's pass), children from 3 to 11 years old will have admission to the main monuments and the Science Park Museum, and it also includes a discount card for city buses and a 24-hour ticket for the Tourist Bus. Ceramics, silver and inlaid woodwork are just some of the most famous craft products from Granada. There is a wide range of shops in the streets of Granada, from workshops, franchises, traditional and prestigious shops to shopping centres and street markets, giving the visitor numerous different alternatives for a day’s shopping. From the silver, crafted figures of the Alcaicería, to the fashion, shoes and perfumes of the shops in the centre of the city and the large shopping centres on the outskirts, including the second-hand objects in the street markets, Granada offers products to tempt all kinds of shoppers. Opening times: some shops, especially the large franchises, are open from 10am-8.30pm, and the shopping centres are open from 10am-10pm. Traditional shops open from 10am-1.30pm and from 5-8.30pm, approximately. Sales: the winter sales generally begin in the second week of January and go on until the end of February, and the summer sales begin on 1 July and run until the end of August. How to pay: most people pay in cash or with a credit card, when you must show your passport or identity card. Tax free: residents from outside the European Union are entitled to have Value Added Tax (IVA) refunded on purchases of more than €90.15. Granada is part of the European Federation of Convention Cities, a reason why it has numerous exhibition halls and conference rooms, as well as a wide selection of hotels. Each year Granada attracts a large number of trade fairs, symposiums and international conferences, lured by the city's artistic and historic heritage, its rich cultural agenda, and its good connections to the rest of the country by air, railway or road. Granada's Exhibition and Convention Centre, located in the heart of the city, is the biggest infrastructure devoted to these purposes. This complex of buildings is divided into nine versatile rooms of different capacities (seating a total of 3,560 participants), with a total of 4,000m2 of exhibition space, press rooms, a restaurant and an open-air auditorium with capacity for 1,700 people, among other services. There are a myriad of exhibition halls and conference rooms available, without having to leave Granada's city centre. Each event can find a suitable space. For example, the Manuel de Falla Auditorium offers spacious rooms (890 and 468 seats), while the Madraza Palace, the Cordova Palace and the Palace of the Condes de Gabia have all been equipped to house temporary collections and exhibitions. The Carmen de los Chapiteles and the Carmen de los Mártires have beautiful gardens in which open-air receptions can be organised, making any event an unforgettable experience. Another trade fair centre is located only three kilometres away from Granada's city centre: the 60,000m2 Armilla Trade Fair Centre. The complex, which is equipped with all necessary services and is very well connected by public transport, is divided intro three pavilions of different size, suitable for the most varied purposes. Accommodation in Granada will not be a problem for the business traveller. More than 7,000 places, the majority of them three or four star hotels, are spread throughout the city, both in the historic quarter and in the more modern areas. In general, these hotels are within walking distance of the conference centres.